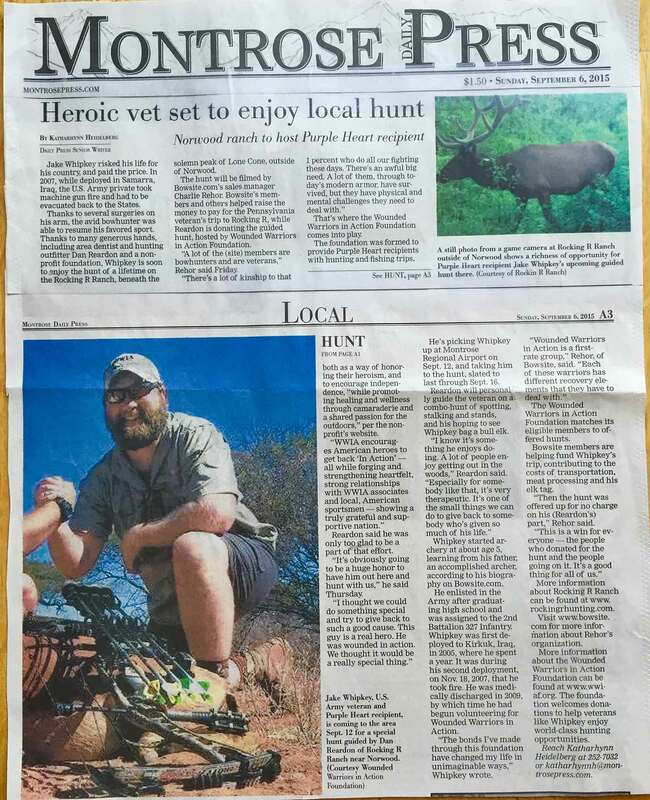 Last year while elk hunting with Dan Reardon, Owner of Rocking R Ranch we discussed a mutual desire to host a Wounded Warrior on an Archery Elk hunt. We agreed to make it happen this year and began the planning. Our major concern was how do we find the right Warrior for the hunt? I was introduced to www.WWIAF.org which is a a non-profit organization established in 2007 specifically to provide Purple Heart recipients with hunting and fishing opportunities. The Wounded Warrior registers with WWIAF and sets their desired outdoor experience and then WWIAF attempts to match them to the offered events. 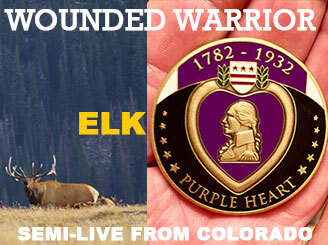 I have since learned this organization goes way beyond providing hunting and fishing trips for Purple Heart Recipients. Our 54,000+ seriously Wounded Warriors since 2001 need lots of help both physically and psychologically to adjust back to productive lives. These events allow them a place of mutual gathering to not only experience the great outdoors but to talk with peers and fellow outdoorsman about how to best get well and productive. I will talk more about Jake Whipkey the Wounded Warrior but first I'll describe picking him up at the airport. 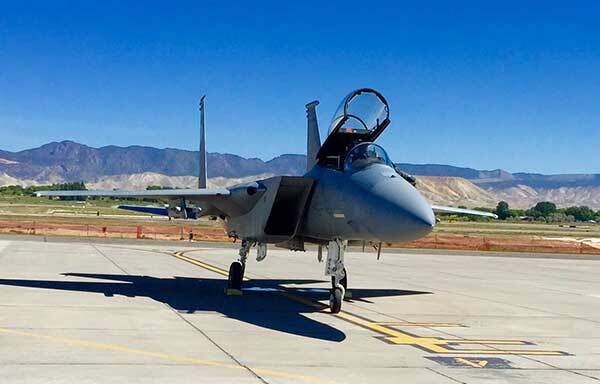 I arrived a little early at the Montrose, CO airport and while waiting I saw/heard an F15 Fighter jet arrive at the airport. A crowd gathered to view the jet and meet the Pilot. I soon found myself talking to a Vietnam Veteran paratrooper from the 82nd airborne. I told him I was hosting an Iraq WW on an archery elk hunt and he smiled. He then told me about when he came home from Vietnam they were required to dress in plain clothes to avoid trouble with war protesters. He said his fellow Vietnam Veterans have vowed not to let this happen to this generation of Warriors. He asked if he could meet Jake and while approaching Jake's arriving plane the F15 Pilot also agreed to meet Jake as he came off the plane. When Jake came off the plane it was very special. A Wounded Warrior from the Iraq war, a Colonel, F15, fighter pilot and a Vietnam Veteran paratrooper shaking hands and thanking each other for their respective service. Man, I am one humbled guy! Also arriving on the same flight is (BowDoc) Brendan Mulholland a primary care physician from New Jersey and his friend John a fellow Doctor. Brendan made a generous donation to Jake's hunt. This will be their first archery elk hunt. During the 90 minute drive from Montrose to Rocking R Ranch Jake and I got a chance to talk about lots of things but mostly about archery elk hunting and the mission of www.WWIAF.org. We immediately felt comfortable with each other and talked freely. 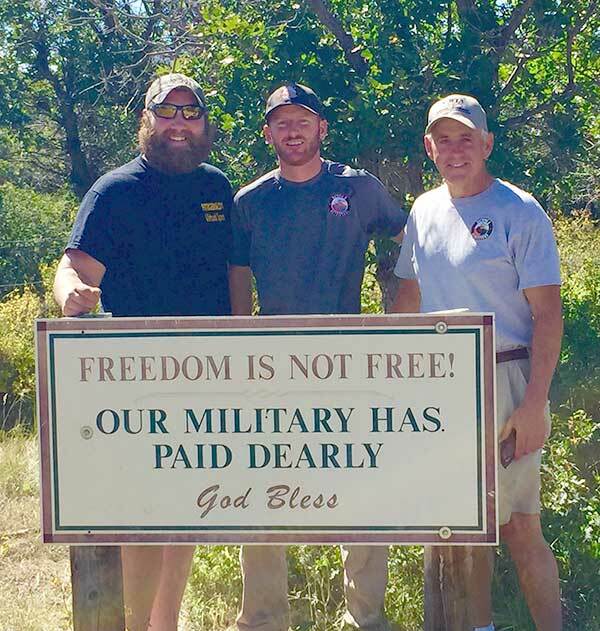 When we arrived at Rocking R Ranch we posed at this sign at the entrance which sets the stage for our event. 1% of the American population serves in our volunteer armed forces and we are very appreciative of them answering the call. We can not take this for granted. We spent the rest of the afternoon meeting the other hunters, shooting the bows and then watching elk in the evening from the porch of the Rocking R Lodge. We met brothers Ron and Craig Stoecklein from Kansas. Both Bowsite members and contributors to Jake's hunt. This will be their first elk hunt as well. In addition there at 4 muzzleloader hunters. Bowsite Visitors and Sponsors are the BEST ! When we set up the hunt many came to help in different ways. Dan at Rocking R Ranch, offered up the hunt at no charge, Sitka Gear Outfitted Jake with a complete set of Gear for the hunt, Dennis Razza, (Razza's Taxidermy) offered a shoulder mount and many of you (fellow Bowsite folks) donated money which covered ALL of Jake's incidental costs. THIS ENTIRE HUNT WAS FUNDED BY BOWSITE SPONSORS AND BOWSITE MEMBERS. THANK YOU ALL VERY MUCH!! A special thanks to these fantastic sponsors. They did not ask for any promotion at all, they donated because they wanted to help out with this special Wounded Warrior Hunt. It is important for us here at Bowsite to extend our gratitude for their generous donations.